First of all what does Hypermobility mean, if we break the word down ‘Hyper’ means to ‘too much’ and ‘Mobility’ basically means ‘movement’ so Hypermobility = too much movement. It’s a syndrome that affects the connective tissue in our bodies, this is the stuff, the glue that holds our tissues and body together, it forms our ligaments, tendons, muscle, skin and most other things, there are different sub types and with hypermobility you have too much of a certain type and its disorganised in its structure, this is caused by a gene mutation and it is nothing that you can, or could have prevented. Now some people confuse hypermobility as being double jointed, you know those people with that party trick that turns your stomach, the ones that can bend a finger, elbow or shoulder into a position that they just shouldnt be able to (see above!!! ), but my flexible friends, please don’t panic…. double jointed or flexible people do not automatically have Hypermobility Syndrome (HMS), far from it, HMS is thought to only affect between 4-15% of the population depending on whose research you read. But there are differing forms Hypermobility, some more severe than others, there is also blurring of the condition with some other medical conditions such as Ehlers-Danlos Syndrome (EDS), Marfan Syndrome and Osteogenesis Imperfecta, for instance HMS and EDS Type III are now classed as one and the same diagnosis, but for this article I don’t want to get bogged down in these other causes of joint hypermobility, instead I want to show you how you can decide if you are just flexible or possibly have HMS, if you should seek further advice and guidance and what impact this may or may not have on your sport and exercise choices. So how do you know if you have Hypermobility Syndrome (HMS)? There are two classification systems that you can easily use if you think you may have HMS and want to seek further guidance, there is the Beighton Score (BSc) and the Brighton Criteria (BC), this can be confusing with the similar sounding names but they are not to be confused as one and the same thing. Joint pain (> 3 months) in one to three joints or back pain (> 3 months). Dislocation or subluxation (slipping of a joint) in more than one joint, or in one joint on more than one occasion. Soft tissue problems, more than 3 lesions (e.g. epicondylitis, tenosynovitis, bursitis). Abnormal skin: striae (stretch marks), hyperextensibility, thin skin, papyraceous scarring (purple stretch marks). Eye signs: drooping eyelids or myopia (short sighted) or antimongoloid slant (downward slant of eyes). So if you have two major, or one major and two minor, or four minor criteria, you more than likely (93% certain) to have hypermobility syndrome (HMS). So do you think you have HMS?, well my first piece of advise is please don’t panic, I personally have seen and treated a lot of people with HMS, especially in my role as a shoulder specialist with this joint being affect a lot in HMS, and nearly all lead healthy normal active lifestyles, including sports, yes there is some modification needed and an awareness from time to time that you will have some joint pain, but this will be temporary and will go with the correct advice and management. That leads me to my second piece of advice if you think you have HMS, go and see a specialist physiotherapist, yes I said physiotherapist… why?, bias, probably, I am one after all, but mainly as a physio with experience in hypermobility is much more likely to spot and deal with the day-to-day management and issues of it rather than your GP. It was noted in one study that GP’s missed Hypermobility Syndrome as a cause of joint pain in as much as 60-75% of cases putting the pain down to muscle strain etc, its only when referred to a physiotherapist that the diagnosis made. This is absolutely no criticism of my medical colleagues far from it, but in their busy clinics they normally only have 5-10 mins to assess and diagnosepatenrs, physios on the other hand usually tend to have an hour with each new patient so are able get a more detailed, fuller history and it’s only when digging deeper can the HMS pattern emerge and a diagnosis be made. A specialist physio can then also check for signs of those other medical conditions such as EDS, Marfan’s or Osteogenesis Imperfecta and refer you on to a specialist HMS consultant for further testing if deemed necessary, although these are rare occurrences. Now the next question and main point of this article is if you have Hypermobility should/could you play sports and exercises. Yes, you must exercise… research has shown that although you can’t change the structure of the lax tissues holding your joints together, gentle non impact exercise can increase the control and stability of the muscles around the joints, so reducing the shearing forces, so reducing the joint pain. The best type or style of exercises recommended is unclear, but general consensus is exercises that are best for HMS are non or low impact, that work in multiple directions and includes light body weight strengthening with control and balance work. The best exercise/sport that covers all of these points is swimming, but activities such as cycling, rowing and using things like cross trainers etc are ok, but these only tend to work in one direction so not utilising all planes or angle of movement. Activities such as gentle light weight resistance training are ok, if directed under guidance. No, don’t do some sports… unfortunately with hypermobility it is not recommended to do certain sports, especially those with high risks of collision and impacts, such as rugby, hockey, skiing, trampolining etc its common sense really, but what about those non contact sports like running and alleged non contact team sports like tennis, football and netball (although watching these non contact sports I do see a lot of collisions) well its a grey area with no general consensus, again, they are going to cause shear and impact forces into the joints and this may produce pain and discomfort. My advise is it really depends on the level of HMS you have and the frequency and intensity of the activity. I have had HMS patients run/jog regularly with no problems, until they increase the mileage or distances quick, to fast, just like I have had HMS patients play netball with no problems until they try to make that catch which they had to over reach, but the pain is always temporary and not damaging, they have a bit of rest occasionally some physio treatment and then return back to doing the sport they love, with the knowledge that yes its a bit more risky but as sensible human beings it’s about weighing up the risks v’s benefits, when one out weighs the other, then a decision can be made. I recently attended the UCL in London to go to Professor Grahame’s clinic and was told by the specialists my muscle is holding my body together and my activities were encouraged: olympic weightlifting; dressage; gymnastics. I am lucky though, my EDS is fairly mild and I have always been active, but I like to think encouraging strength in EDSers and the hypermobile alike (achieved carefully and avoiding injury) is the absolute way forward to giving us all greater control over our condition 🙂 (I also agree a physio, who is a specialist in EDS if that’s what you have, is paramount – a normal physio without awareness can give advice which, although correct for the norm, is not helpful to the hypermobile. Just wondering if there has been any research done with the use of Human Growth Hormone to help HMS, as it has been shown to help joint, muscle and ligament injuries etc. It’s great to find people talking about this, Adam, thanks. I’m just 21 and I’m just coming out of a bit of a rough patch, psychologically speaking, after 4 years of struggling with something no doctor seemed to diagnose or understand. Most people in the medical world will say swimming is universally great, but, a lover of the sport myself, I’ve just been through three months of therapy for my shoulders and am slowly returning to the pool but I’m still in pain. I would like to ask you if there is anything apart from light weight training for specific muscles that we can do, since holding small dumbells sometimes seems to worsen the pain. Oh, and just in case. It’s not just soreness. Over the past few years every joint in my body has started to click, from my fingers to my ankles, knees, wrists, shoulders and even hip. The shoulder will click inaudibly normally, but every hour or so it will lock and when I lift my arm it will create a loud and unpleasant sound (specially for those around me). The paradox is, even though this noise scares people and would logically be linked to damaging the joint surfaces, it seems to me that they have started clicking when they have got better. I imagine this is because inflamation has subsided, but can it reappear because of the clicking? Seriously, this condition should receive more importance. Hello, I do too can pop my shoulder out of socket and put it back into the socket. So therefore I am HMS. I am into body building and my shoulders kill me everytime I lift weight. Does this mean Im going to have to stop weight lifting ? I just read this article and am pretty sure I have this. I am 9/9 on the scale. I am a competitive swimmer and a rather new cheerleader and just wanted to know how you felt about it? Both require a lot of full body motion and movement. I have rather ‘flexible’ knees and shoulders. I can’t stop stretching because as a cheerleader you want to be flexible, but I don’t want to damage my body. HELP! I also want to know what you suggest as exercise, as in a way to stay fit/loose weight that wouldn’t be harmful for my body. Hi, I’m really glad I found this article! I have HMS, scoring 9/9 on the Beighton scale and have 2 major and 5 minor for the Brighton criteria (didn’t include 0-3 Beighton score and joint/back pain as they were included in major criteria). I was wondering if yoga was ok to do with HMS or if there was any restrictions? Also if body toning exercises were ok to do? Very interesting article, thank you for posting. 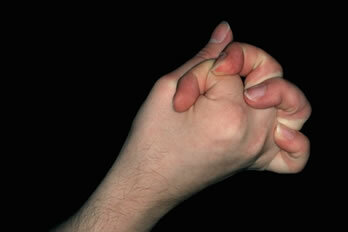 I was told I had hypermobility a few years ago without really much explanation on what it is and what I should do. They just did a bunch of tests on me (most of the ones in the Beighton tests and then gently popping my wrist out of place- weird!) then said ‘yep its hypermobility, we suggest you take up swimming to strengthen all your muscles’ – informative! Anyway I have recently taken up running and have noticed my knees starting to feel a bit weak. They can feel very fatigued and weak like I cant put too much weight on them straight after a run, and sometimes for as long as a couple of days after a run, and they have been clicking a lot more. My knees have never been a problem area for me before it has always been my back and toes. Do you think this is hypermobility related or maybe just something i’m getting from trying to do too much too quickly? Would a patella brace or knee sleeve be beneficial or would it just encourage the muscles around my knee to weaken due to the extra support? Great article- really helpful! I was diagnosed with HMS by a Rheumatoid consultant in 2012 after having a lot of joint pain in my lower back and knees. I was told I was 7/9 on the Beighton scale and not to do any impact exercise. I used to love circuit classes, especially throwing myself over a trampoline to form various shapes and colliding accidentally with others was just part and parcel, throwing medicine/weighted basket balls at a wall for them to bounce back….I can now see why I used to be in pain a lot after these classes. Perhaps I’m a masochist- that pain felt good! It felt like I’d achieved something great. So now I’m trying to keep things sensible, taking Pilates at least once a week, sticking to very slower types of Yoga (another thing which used to cause me pain) and learning that there are some things I just can’t do, not all pain is good pain when it comes to exercise, I now realise that. I don’t know though what to do about pains when they do flare up. I am not always sure why and even if I do find out, can’t always do anything about them, eg I have to walk a lot but this makes my knees really ache and even swell slightly. I have to carry a heavy back, I use a rucksack but WOW does my lower back hurt! I regularly flip on my ankles despite thinking I am walking fine, I seem to walk very clumsily without realising…the list goes on. I can’t afford a physio but have been referred by the NHS to a general physio. Last time I saw them I felt so shocked at what they were telling me and how shoddy the advice was I am reluctant to go back (at one point telling me to hop on a painful leg which turned out after the scan came through that I had a “very obvious” tibial stress fracture all along). I want to help myself but don’t have a clue what to do or where to start. If my knees are hurting a lot, what should I be doing- is there anything I can be doing and is there ever going to be a day where my back doesn’t feel uncomfortable (as though it doesn’t fit properly) or end up in agony with my attempts to do what relases the irritation at the time- stretching it out. I’ve tried to read up on things but advice seems at best very general and most of the time information tends to be on what is/can go wrong rather than how you can better things if you are in pain and spending days on a sofa isn’t an option. I want to help myself, I just don’t know how! Any advice would be greatly appreciated as my GP just keeps shrugging their shoulders. I am in my 30s and already feel like I am old before my time. Not how I want to live my life! I have Hypermobility Syndrome and I’m only 16 and I’ve been a cheerleader for 9 years now. I have so much pain in my elbows, wrists, knees, ankles, shoulders, and jaws. The pain takes over In my sleep so bad and much. I just curl up In a ball and just lay there because the pain is so bad. I mess with my joints when they starts to hurt because they make it feel better for that minute. People think it’s disgusting when I mess with them or even when I don’t. I have Raynaud’s Phenomenon which is kind of in relation with Hypermobilty Syndrome. The pain is even worse when those two happen together. My doctor wants to get my tested for other diseases since I have these two. Any ideas on what he might be looking for? Very helpful article thank you. I have been doing a lot of crosstrainer work to strengthen me up a bit but am finding my knees aching more and hips. I expect I should cut back and mix it up with more swimming which I was doing more of previously. Thank you for helping me figure this out. Thanks for sharing such useful information. I am 35 male suffering with BHMS. It started with lower back stiffness. Doctors were not able to diagnose it for more than a year as all mri and blood tests were normal. Now my problem is that my lower back hurts a lot. I want to do bodybuiding but I am afraid it might increase the pain. My knees also hurt when I jog. Even if I jog at a very low speed. Kindly help. I have also read that collagen supplements can help. What are your views? Thank. Thank a lot for your very useful article and for answering the questions! I hope I’m not too late. What do you think about climbing? And bouldering?